Imagine this, you're going to sit down on the toilet and suddenly a little face is looking up at you from in the water.... OMG! It's a frog!! Eeek! That's exactly what happened to my daughter the other day. She screams for us to come in to the bathroom, and there was this frog just looking up at us from inside the toilet. As soon as hubs went to grab him, he jumped from the toilet, to the tub to the wall, to the window, and back to the wall again before we finally caught him, (when I say "we", I really mean hubby, Princess and I were standing at a semi-safe distance doing our own jumping each time it would come flying in our direction.) Of course, I'm not afraid of a little frog...but this was no little frog! He was huge! and unpredictable! I don't know how he got in the toilet to begin with, but what if she hadn't seen him and had sat down? It could have jumped right up on her hoohah! She may never use that toilet again! First a frog in the bathroom, then a dinner guest. 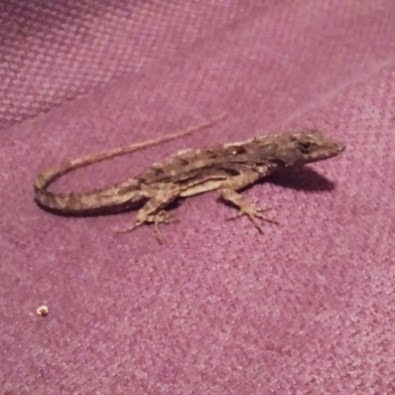 Look who was sitting on my dining room chair when we sat down to dinner last night; a lizard! Ahhh, the joys of Florida living...you just never know what kind of critter you'll see next!